For this project, I relied heavily on the Magnetic Lasso Tool, the Rectangular Marquee Tool and the Elliptical Marquee Tool. I also made use of the regular Lasso Tool and the Magic Wand Tool. The transform options were a huge help as well, since I had to resize many of the images to work in relation to each other. Prior to this assignment, I had played around with these tools, but never knew what they could really do. I had never used the “Refine Edges” option to adjust the selections, so I had a lot of fun messing around with those sliders. The main options I utilized were feather and smoothness. I was amazed at how much of a difference they made, and how much better the overall piece could look as a result of those options. I adjusted the opacity of a number of layers, and also changed some of the “Blending Options” for layers to add Drop Shadows and/or the Bevel and Emboss effect. I’ve used these effects before, but for anyone who has not I will explain how to access these effects. Once you’ve created a layer, you can right-click the layer name in the layers window (Ctrl+click for Mac users) and select Blending Options. Now you can add drop shadow, outer or inner glow, bevel and emboss, and other effects. I used the shadows and bevels to create depth in the piece since that was our main focus this week. I didn’t want to just put stuff on top of each other but still have it look flat. I think these effects helped to give this more dimension. While I know there were definitely other things I could have done to make this better (and I look forward to hearing my classmates’ critiques next week), I really am happy with how this collage came out. I hope people enjoy looking at it even a tiny percentage of how much I enjoyed making it. 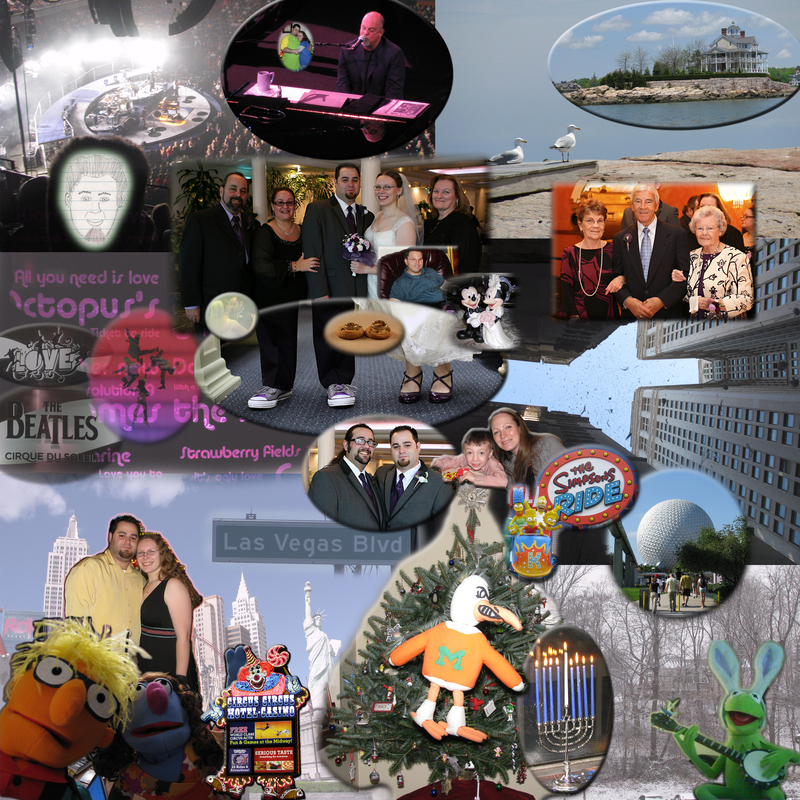 So, tell me – what do you think of the collage?